This newly renovated corner Bay View condo features spectacular Gulf views from the 8th floor. Not only is this a corner unit, but it also has an oversized balcony that forms a complete L-shape along the entire length and width of the dining and living room! Enjoy time on your furnished screened-in balcony, with no shortage of photo opportunities of breathtaking scenery and lavender skies. This luxury vacation rental in Sanibel Harbour is well-appointed with a delightful palette of neutral, pale blue and wood tones to make up an appealing modern Florida-style décor. Both bathrooms and the kitchen have been completely revamped! The kitchen features all new stainless steel appliances, cabinets, tile and countertops, and the bathrooms have been renovated from top to bottom. There is an HD TV and DVD player in the living room, an HD TV with a Blu-ray DVD player in the master bedroom, and an HD TV in the guest bedroom. The king bed in the master, two twin beds in the guest, and the sleeper bed in the living room ensure that you'll be able to bring along your entire vacation party. 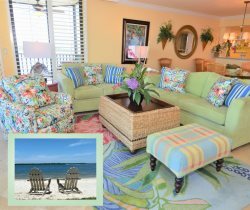 This Sanibel Harbour Bay View condo is one of the most exquisite rentals you will find. You may have found this rental on HomeAway 4832544, HA ID 4832544, VRBO 4832544, or Vacation Rentals 4832544. Great stay. Only couple of points: we couldn't find a cheese grater! Which would have been useful and we would have liked access to the gym 24 hrs which is given to Marriott guests and really would not impact the spa but restricted us to 8.30 - 6.30 which was difficult to achieve. Thank you so much for the experience, we loved Sanibel and would certainly like to return. We had a great time. We were in town for a baseball tournament. Our condo was beautiful. The amenities at the resort were nice. The only complaint was the condition of the water in the bay , but you have no control over that. If the water had been better we would have rental the kayaks, etc. The pool were great, the food in the restaurants and bar were very good. It was a great overall experience . Enjoyed our stay, nice quiet beach. Visited the Marriott , had afternoon drinks, while watching dolphins play. What could be better?? All members of team are very helpful. They allowed us early check-in due to our very early flight. We enjoyed our stay and look forward to our fourth visit next year!